The aircraft engines market is projected to grow from an estimated USD 68.05 billion in 2017 to USD 92.38 billion by 2022, at a CAGR of 5.23% during the forecast period. The base year considered for the aircraft engine market study is 2016 and the forecast period is from 2017 to 2022. 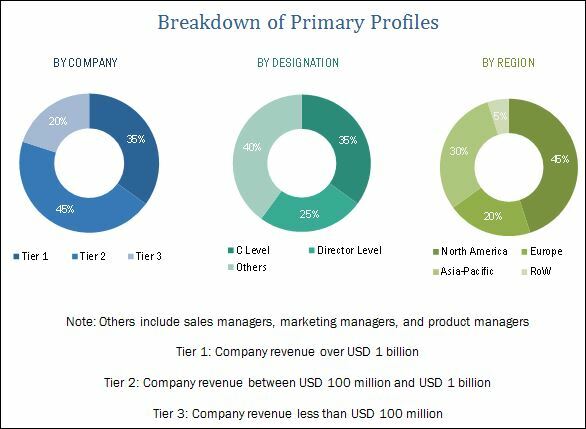 The report analyzes the aircraft engines market based on engine type (turboprop engine, turbofan engine, turboshaft engine, and piston engine), application (commercial aviation, military aviation, and general aviation), and platform (fixed wing and rotary wing); and maps these segments and subsegments across major regions, namely, North America, Europe, Asia-Pacific, and Rest of the World (RoW). The report provides in-depth market intelligence regarding the aircraft engines market and major factors, including drivers, restraints, opportunities, and challenges that may influence the growth of the market, along with an analysis of micromarkets with respect to individual size,growth trends, prospects, and their contribution to the overall aircraft engines industry. The report also covers competitive developments, such as long-term contracts, new product launches and developments, and research & development activities in the aircraft engines industry, in addition to business and corporate strategies adopted by the key market players. Market size estimation for various segments and subsegments of the aircraft engines industry has been arrived at through extensive secondary research sources such as Airbus and Boeing Aircraft Market Outlook, Federal Aviation Administration (FAA), and International Air Transport Association (IATA), as well as annual reports and publications, among others, and in corroboration with primaries. Further market triangulation has been done with the help of statistical techniques using econometric tools. All percentage shares, splits, and breakdowns were determined using secondary sources and verified through primary sources. All possible parameters that affect the market have been accounted for, viewed in extensive detail, verified through primary research, and analyzed to acquire the final quantitative and qualitative data. This data is consolidated with detailed inputs and analysis from MarketsandMarkets, and presented in this report. 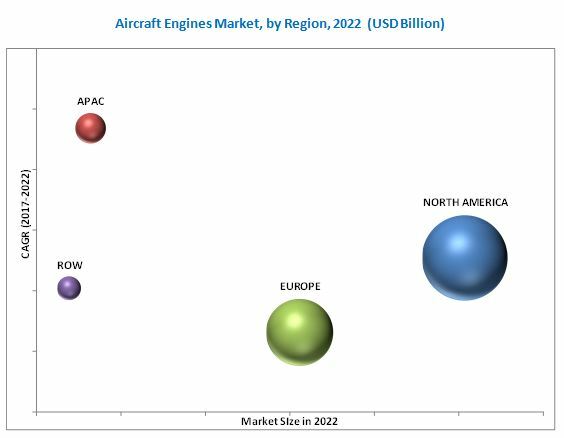 The aircraft engines market ecosystem comprises engine manufacturers, such as General Electric Aviation (U.S.), United Technologies Corporation (U.S.), Safran SA (France), and Rolls Royce Holdings PLC (U.K.), among others. The major customers of the aircraft engines are the airlines and military. In 2017, GE Aviation was awarded a contract by US army for the production of 2,500 T700 turboshaft engines for US Army, Navy, Air Force, Marines, Coast Guard, Foreign Military Sales (FMS) and other government agency. The aircraft engines market is projected to grow from an estimated USD 68.05 billion in 2017 to USD 92.38 billion by 2022, at a CAGR of 5.23% during the forecast period. This growth can be attributed to the increasing aircraft orders as a result of increasing air passenger traffic across the globe, which is the key factor driving the demand for aircraft engines. Airliners are opting for fuel-efficient, 3D printed aircraft engine parts and lightweight engines to replace old engines in their aircraft. The aircraft engines market has been segmented based on engine type, application, platform, and region. Based on engine type, the market has been segmented into turboprop, turbofan, turboshaft, and piston engine. 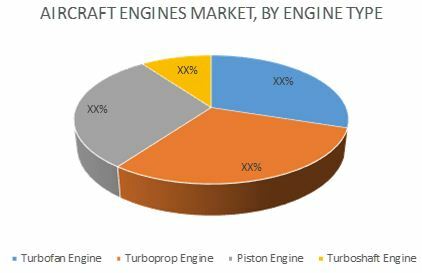 The turbofan engine market segment is expected to witness the highest growth during the forecast period, as airlines are focusing on increasing fuel economy which is provided by these engines. This factor is expected to drive the aircraft turbofan engine market. Based on application, the aircraft engines market has been segmented into commercial, military, and general aviation. The commercial segment is expected to witness the highest growth during the forecast period. The increase in the number of passengers has propelled the demand for new commercial aircraft from airlines. This has resulted in the growth of aircraft engine industry. The aircraft engines market, based on platform, has been segmented into fixed wing and rotary wing. The fixed wing segment is projected to grow at a higher rate during the forecast period as there is more demand for fixed wing aircraft across commercial, military, and general aviation applications. The geographical analysis of the aircraft engines market includes regions North America, Europe, Asia-Pacific, and Rest of the World (RoW). The North American region is estimated to have accounted for the largest share of the aircraft engines industry in 2017. The Asia-Pacific region is projected to be the fastest-growing market during the forecast period, supported by the increase in passenger traffic and aircraft in countries such as India and China, among others in the region. The existing backlogs in aircraft deliveries can act as a restraint in the growth of the aircraft engines market. Limited manufacturing capacity of major aircraft manufacturing companies has led to a large backlog of aircraft deliveries. Products offered by various companies in the aircraft engines market have been listed in the report. The recent developments section of the report includes recent and important developments by various companies between 2014 and 2017. Major companies profiled in the report include General Electric Aviation (U.S.), United Technologies Corporation (U.S.), Safran SA (France), and Rolls Royce Holdings PLC (U.K.), among others. Contracts accounted for a major share of the total growth strategies adopted by the leading players in the aircraft engines market. Airlines around the world are focusing on installing fuel-efficient aircraft engines, as fuel has major share in the overall operating cost of an aircraft flight. The increase in efficiency also results in reduced maintenance cost. Hence, many engine manufacturers are coming up with different fuel-efficient engines. This will help the aircraft engines market grow in the near future. Aircraft orders have been growing over the past few years owing to the increasing passenger traffic and rise in profitability for airline operators. These factors have led to an increase in aircraft orders across the globe. The airlines are installing turbofan engines for these new aircrafts orders as the engine has increased efficiency, less fuel consumption, and less noise. The turbofan engine is a variant of the turboprop engine. The inlet of the engine is equipped with a large internal propeller, also known as a ducted fan, which allows two streams of air to flow through the engine. The primary stream of air passes through all components of the turbine engine, whereas the secondary stream of air is accelerated through a nozzle to produce additional thrust. These types of engines are used in commercial aviation and business jets. A turboprop engine is an advanced version of the traditional jet engine wherein the engine inlet is equipped with a propeller. The propeller is rotated at high speed using the power produced by the engine through a gearbox. This rotation produces additional thrust. These engines are used mainly in general aviation applications. The turboshaft engine is a type of turboprop engine used in rotorcraft. The operation of turboshaft engine is similar to that of the turboprop engine. It drives the propulsion by converting the gas stream energy into mechanical power. The power produced by turboshaft engines is used to rotate the turbine rather than producing thrust. Piston engines, also known as reciprocating engines, were used to power aircraft till the jet engines were developed and proved. Piston engines are made of one or more cylinders. Piston engines are mostly used in ultralight aircraft for personal aviation.